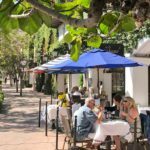 The Downtown Santa Barbara organization requested partial funding for an assessment of needs to improve the 400-1200 State Street section of Santa Barbara’s El Pueblo Viejo (The Old Town) historic district. Given the unique and challenging discussions around public space improvement within the El Pueblo Viejo District, the Downtown Santa Barbara organization proposed to engage Arcadia Studios, as the current area landscape planner, to conduct initial planning study to update and improve the State Street streetscape for the community’s benefit. Improvements would address benches, lighting, trees and infrastructure. Ultimately, improvements to this busy downtown area would result in Improved safety, appearance and the overall State Street experience, quality of life, improved vitality and better environment. Partial funding from Downtown Santa Barbara Board, plus in-kind staff/office/convening role.